Paesaggi e storia tra Limone, Riva e Gargnano. It is difficult not to be impressed when you drive along the road between Toscolano, passing by Gargnano and Campione to reach Limone from the south, or via Nago, Torbole and Riva to reach Limone from the North. This part of Lake Garda, its rocks, its Mediterranean vegetation of cypress, oleander, agaves, Judas trees, the red ivy in autumn covering the rocks make for a stunning landscape that always was there and always will be….we can only be there for a moment, one day a week or a lifetime and carry it away in our memory. These thirty kms of Gardesana road are worth a visit, looking out of the window of a car, stopping sometimes to see the rocks, above you or below you, reaching the water as blue as the lake sometimes is with shades of turquoise and glittering like a mirror blinding your eyes when you suddenly come out of a tunnel. The beauty of the rocks with their different shades of silver, remind one somehow of the Amalfi coast in Naples. Once you know the history of this 28 km stretch of road, you cannot not love it and drive along it many times. Fulvio Zezza, Prof. of Geology of the University of Venice, in his book ‘La strada gardesana Occidentale’ 2009 (The western Lake Garda road) explains how the engineer Riccardo Cozzaglio who developed the project of the ‘Meander’, as Gabriele d’Annunzio used to call it, takes the landscape into account. Cozzaglio solves technical problems by creating a road very much in harmony with the features of the coastal zone (19). D’Annunzio himself wrote: ‘the road should be all engraved, sculpted, ‘italianicly’ (with an Italian style) in the lively rock’ (La strada nella roccia ‘the road in the rock’ by G. Cavallini, 2005). 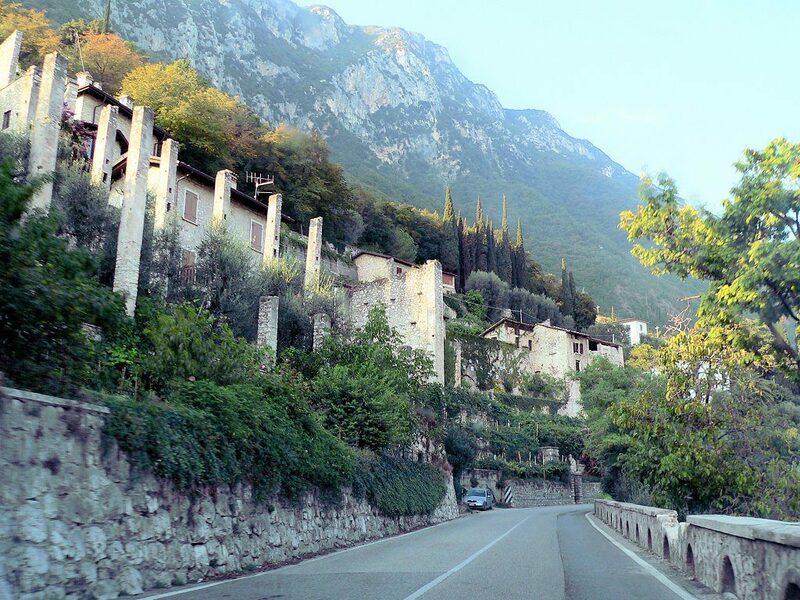 It is said that it was d’Annunzio who wanted this road and was supported by Benito Mussolini. If we read the history of this road, however, behind the whole project was the enthusiastic figure of the engineer Riccardo Cozzaglio, (Brescia 1895-Gardone Riviera 1965) son of Arturo who built the Tremosine road called ‘la forra’ in 1913. The Cozzaglio family was originally from Tremosine, hence genuinely attached to this part of Lake Garda, which was difficult to reach. In 1923 this engineer became mayor of Gardone and wanted to re-establish the relationship with the poet that the previous administration had ruined, hence he involved d’Annunzio, through his aunt Lucia Landi, with the idea to create a road between Gargnano and Riva d/G.. The poet was very enthusiastic about the road and used all his influence by writing letters on behalf of Cozzaglio to the most important people of his time, among whom Piero Puricelli (Milan 1883-1951), a road constructor who played a decisive role in the matter. He placed at the disposal of Cozzaglio his Milan engineering studio, with all the technicians, but also putting pressure on the Mussolini government for the complex bureaucratic and financial procedures that allowed the realization of the project. The road was started in 1928 and inaugurated on the 18th of October 1931. Between 1932-1936 the project by the engineer Giulio Angelini of reforesting the road took place with the planting of 250.000 trees, cypresses along the coast and black maritime pine along the mountain shores. The green, as Zezza explains, was meant not only for aesthetic purposes, but also as a reinforcement of the entire rocky area, and to contain the rivers. The area has since become particularly suitable for rare plants (Zezza, 82-83). During the war, between 1943-44, the tunnels and hidden bunkers were used to build weapons, motors, submarines with a sophisticated technology. Factories such as Breda, Fiat, the National factory that produced weapons were hidden under the mountains. This allowed machinery to be saved and after the war to restart the production. Liberty di Rodella Marco e C. S.n.c.